Terrific shot, the focus is on the driver, the rest of the car blurred giving the impression of speed, something Geoghegan had in abundance. 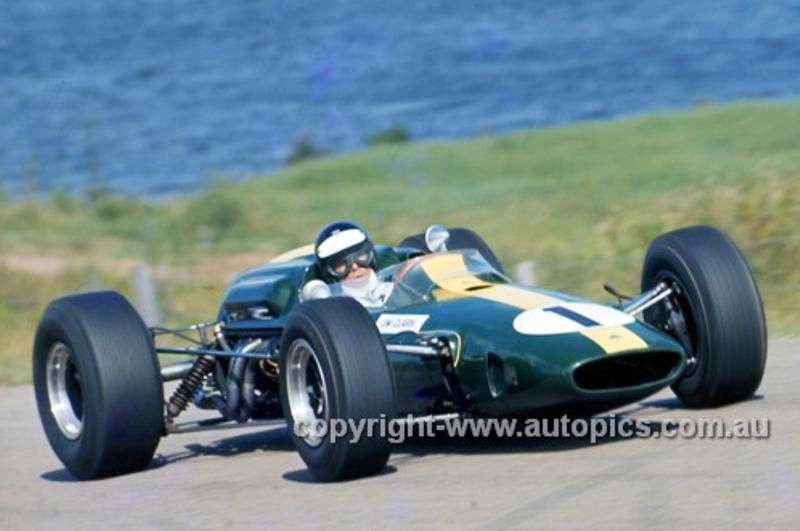 Leo ‘made his name’ in this car, he was a front-runner from the time he bought it off Team Lotus at the end of the ’66 Tasman Series; Jim Clark was third in it, until the time it was put aside to make way for his Lotus 59 Waggott later in 1970. Geoghegan had a long background in Lotus single-seaters after he graduated from sedans and sportscars in the team his father, Tom founded. Starting with an 18FJ in 1961 he progressed through 20, 20B, 22, 27 and then a 32, which, when fitted with a 1.5 Ford Lotus Twin cam engine gave him two 2nd placings in 1965 Gold Star events. 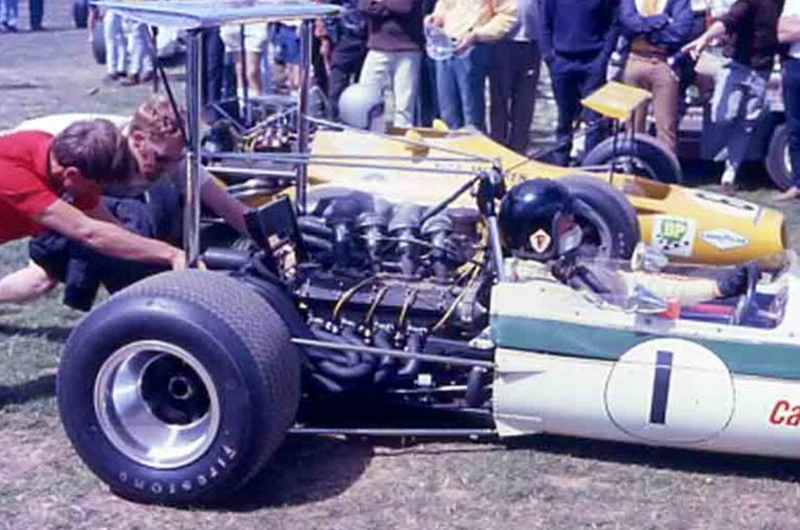 He stepped up to the ‘big time’ with the Tasman Lotus 39. 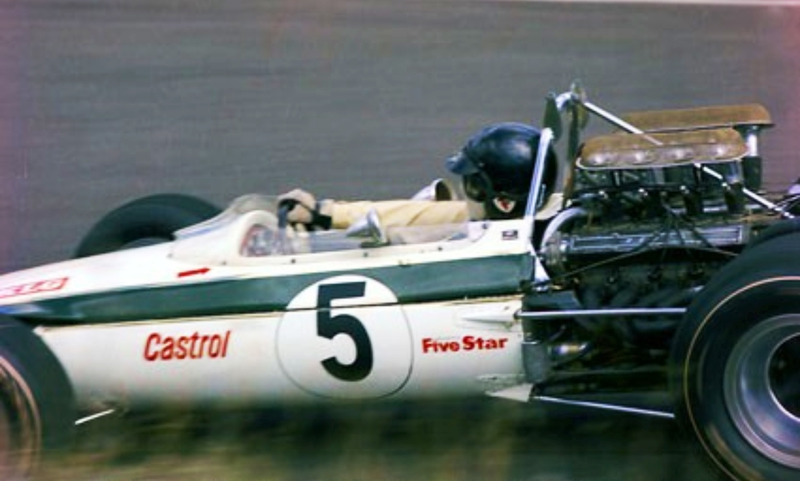 The ‘old girl’ Lotus 39 was frustrating in many ways, its unreliability, like other Repco Tasman users, was notorious, but it gave him the critical 6 points at Symmons Plains in March 1970 before he switched to his new Lotus 59 Waggott. This won him the Gold Star he coveted and deserved…by 6 points from Max Stewart’s similarly powered Mildren. Max’s Gold Star turn would come for the first time in 1971. The Lotus 25/33 series of cars are amongst motor racing’s most famous, the Lotus 25 the first ‘modern monocoque’, Jim Clark took the 1963 and 1965 World Championships’ in Loti’ 25 and 33 respectively. 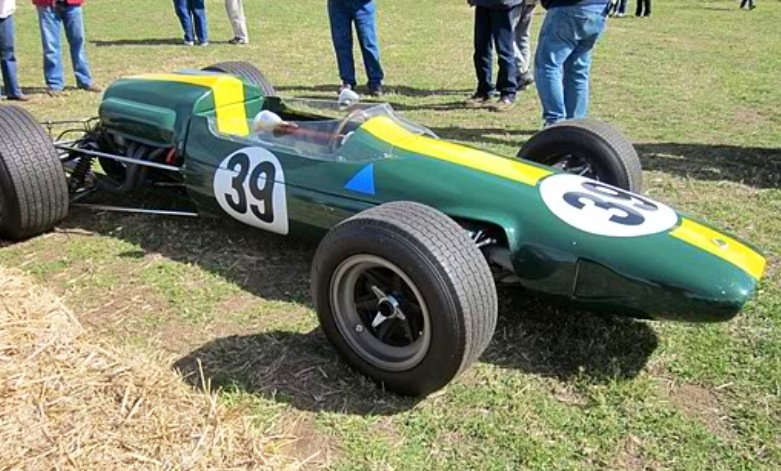 The 39 is one of this series of cars and like Jack Brabham’s 1966 championship winning BT19 chassis was built for the stillborn Coventry Climax FWMW Flat-16 engine. The story of this amazing engine is an article in itself; in a nutshell CC’s Wally Hassan and Peter Windsor-Smith were convinced the best route to more power was higher revs (than their FWMV V8) a ‘multi’ was chosen partially due to Harry Mundy’s exposure to the BRM Type 15 supercharged V16 in the dawn of the fifties. Design commenced in 1963, the prototype was on the test bench in 1964. Torsional problems of the crank were major issues, the engine also failed to deliver more power than the 4 valve versions of the FWMV, which themselves took a bit of development to better the FWMV 2 valve outputs. 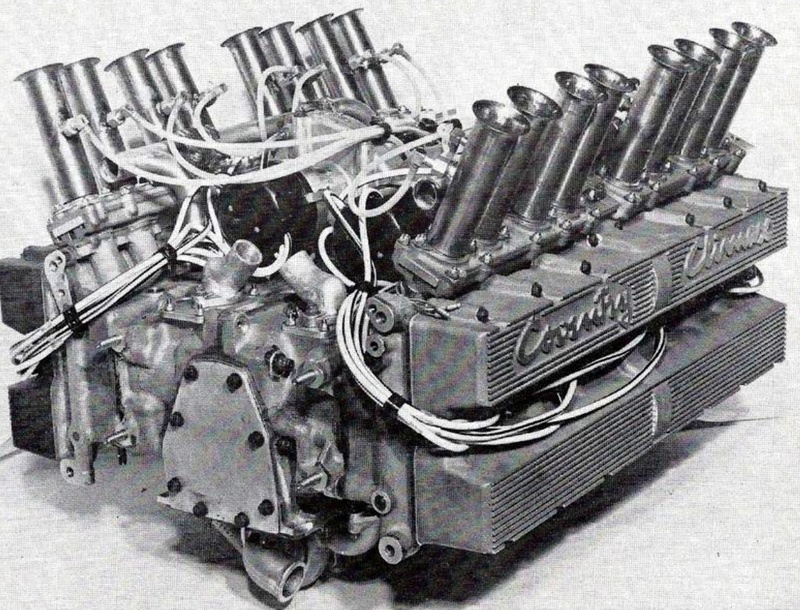 Then the 1.5 litre GP formula ended and Jaguar took over Coventry Climax; that combination of factors ended CC’s pivotal role as a successful supplier of racing engines for better than a decade. 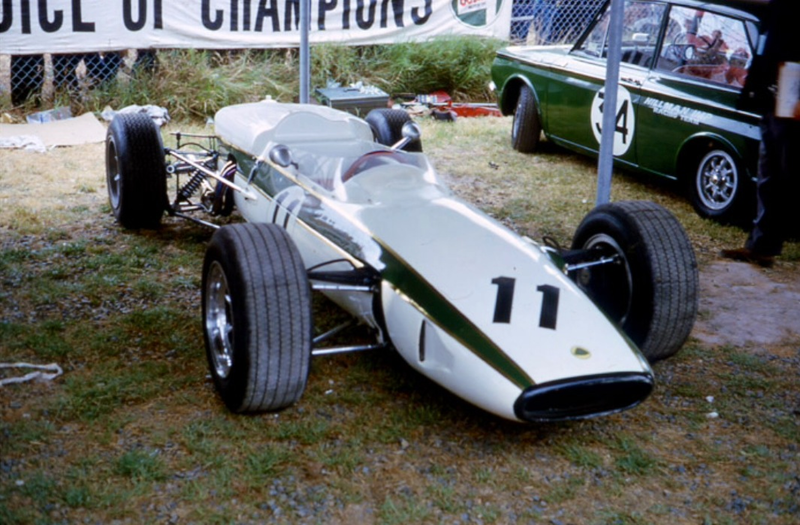 Colin Chapman needed a mount for Jim Clark to defend his Tasman title, he won it in 1965 with a Lotus 32B Climax, the unused 39 sitting in the corner of the Team Lotus workshop was ideal. He tasked designer Maurice Phillippe to modify the engine bay of the car to accept a Coventry Climax 2.5 litre FPF engine. The 39 was different from its siblings in that the ‘D-shaped’ side pontoons of the chassis were ‘chopped off’ at the bulkhead aft of the drivers seat and a tubular steel subframe substituted to carry the CC Flat-16. Changes were made to the frame to accommodate the FPF. The 39 side pods also had a more pronounced belly than the 25/33 to ensure sufficient fuel could be carried, having lost capacity by hacking the ‘rear horns’ off the tub on each side. 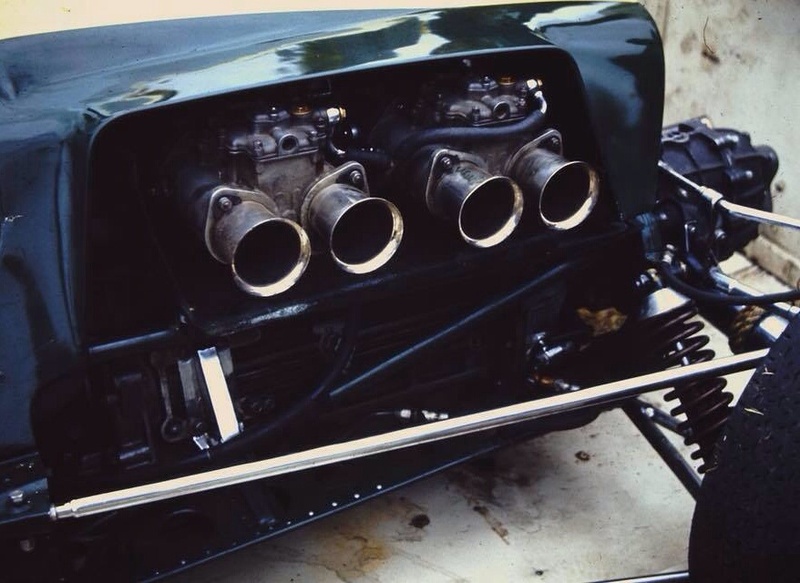 The suspension of ‘R12’ was pure Lotus 33 and was period typical; top rockers actuating inboard coil spring/damper units and lower wishbones and at the rear inverted lower wishbones, single top link and two radius rods for fore and aft location. Adjustable roll bars front and rear as well of course. Steering by rack and pinion and outboard disc brakes on all wheels. 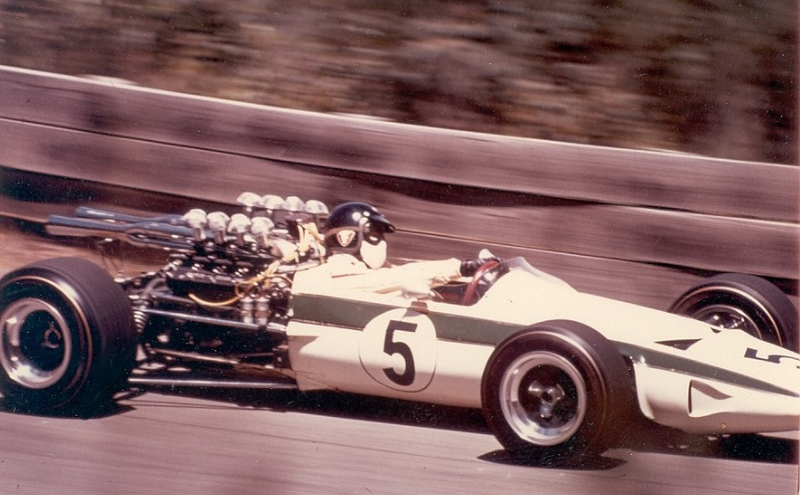 Chapman bought two Climax engines from Bruce McLaren who didn’t contest the Tasman in ’66, he was too busy building cars for his F1 and CanAm programs having just left Coopers. 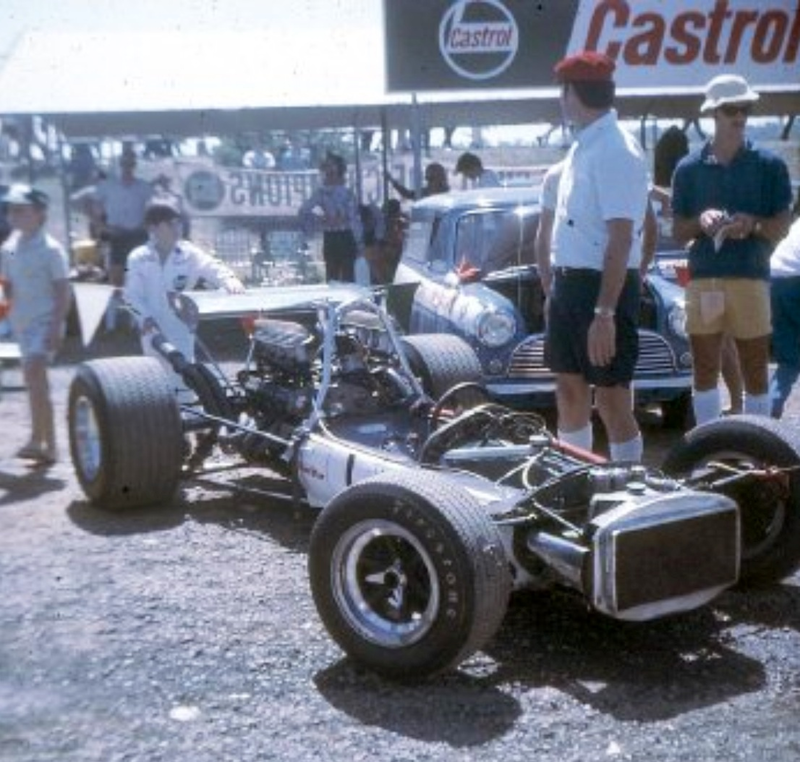 The 39 was soon on its way to the Antipodes for its race debut in the NZGP at Pukekohe on January 8 1966. By 1966 the Tasman game had largely moved beyond the old FPF. Brabham debuted his Repco Brabham RB620 V8 engine and BRM modified its F1 P56/60 V8 engines to 1930cc, Jackie Stewart took the title in a P261 with 4 wins from Hill’s 2 with Clark and Attwood (BRM) 1 win apiece. 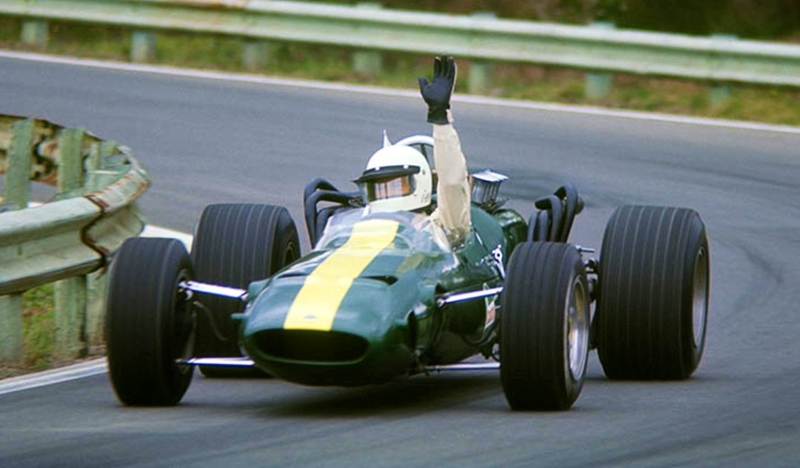 Clark had a tough start to his 1966 Tasman campaign partially because Colin Chapman switched his Lotus tyre contract from Dunlop to Firestone not long before the Tasman commenced. 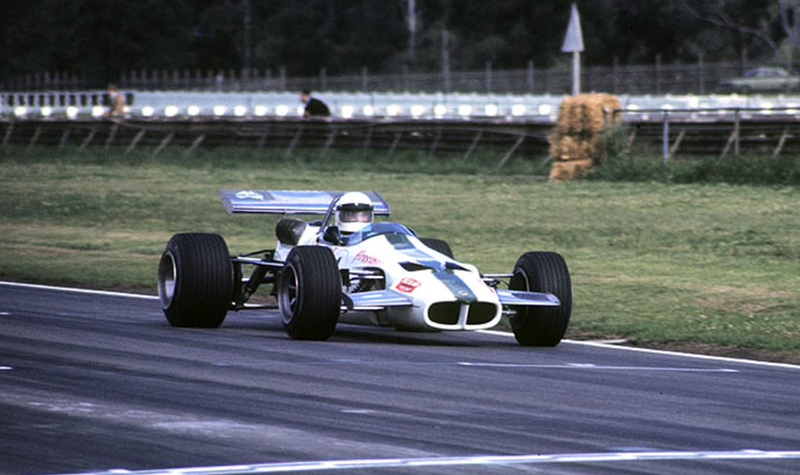 The tyres had been developed by Bruce McLaren, he had used them for over a year and they were competitive but the 39 had to be adapted to them. 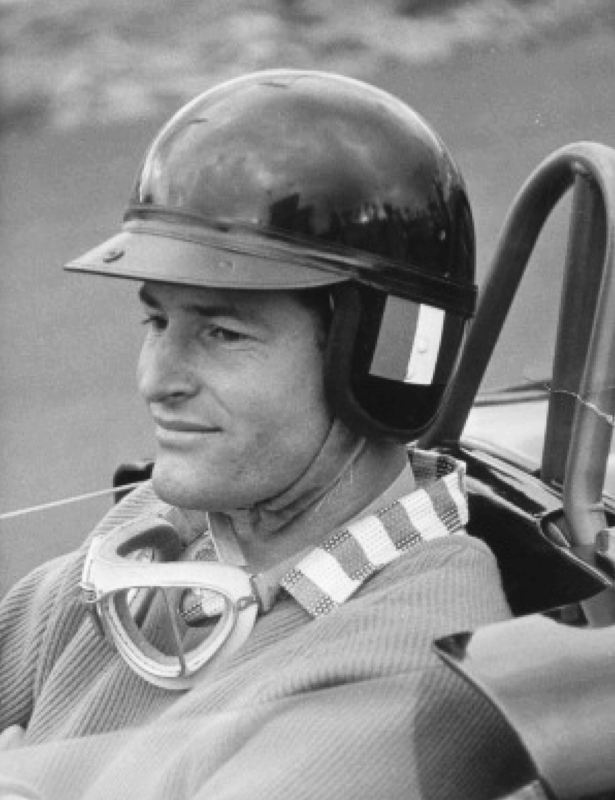 In addition Clark had a run of misfortunes which also reduced testing time; an abortive race at Pukekohe (gearbox) no practice at either Wigram (oil leak and engine replacement/accident when Gardner’s Brabham brakes failed) or Levin (snapped radius rod in practice/2nd). At Teretonga the cars speed was shown with a heat win from Stewart. He was moving away from Jackie in the final only to go out with a spin on dropped oil on lap 3. In Australia he took a win at Warwick Farm, always a happy hunting ground for Clark. 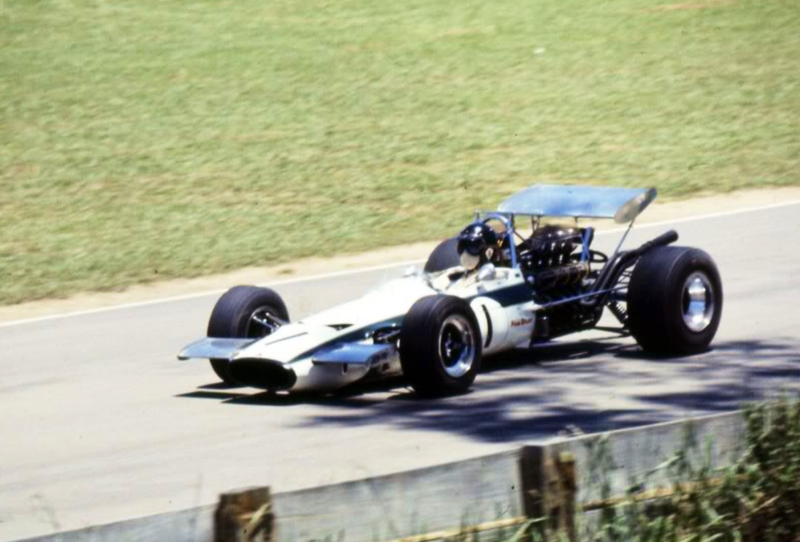 Graham Hill won the AGP at Lakeside from Gardner and Clark. He was 2nd to Stewart’s speedy BRM at Sandown and was 7th at Longford, he had carburetion problems in practice and a plug lead came off in the race requiring a stop and dropping him to the back of the field. Stewart was again the victor, with Jim finishing third in the series behind the BRM duo. 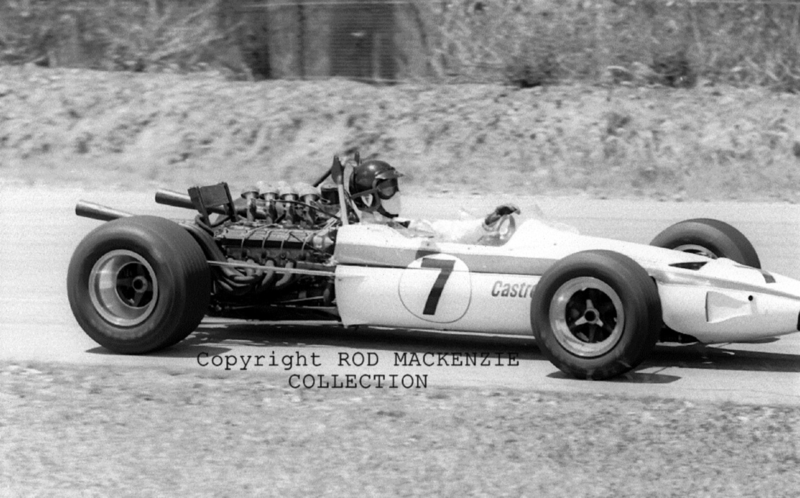 Clark had an amazing 1965 season winning the Tasman Series, Indy 500 and the World Drivers Championship, his start to 1966 was not quite so good, a portent of a tougher year! John Sheppard is a legendary mechanic/engineer/car builder and team manager with some of Australia’s greatest cars in his CV; the Geoghegan’s cars, Bob Jane’s Repco Torana, Laurie O’Neills Pete Geoghegan driven Holden Monaro and the Holden Dealer Team amongst an extensive and ongoing career of car construction and team management. 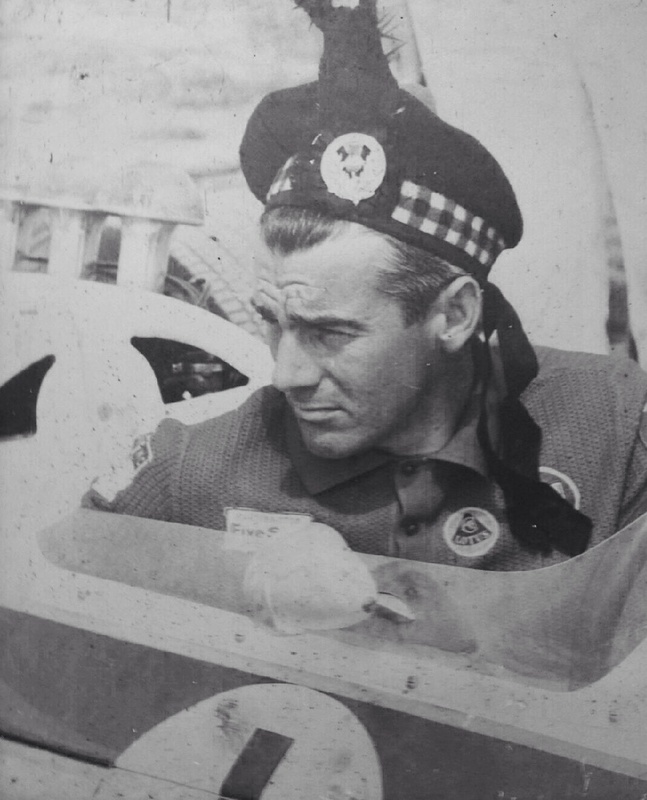 Early in his career he was appointed as chief mechanic to the Geoghegans. Tom took a liking to his work preparing the Youl brothers Cooper, the Tasmanian team were using the Geoghegan’s Sydney workshop at the time. 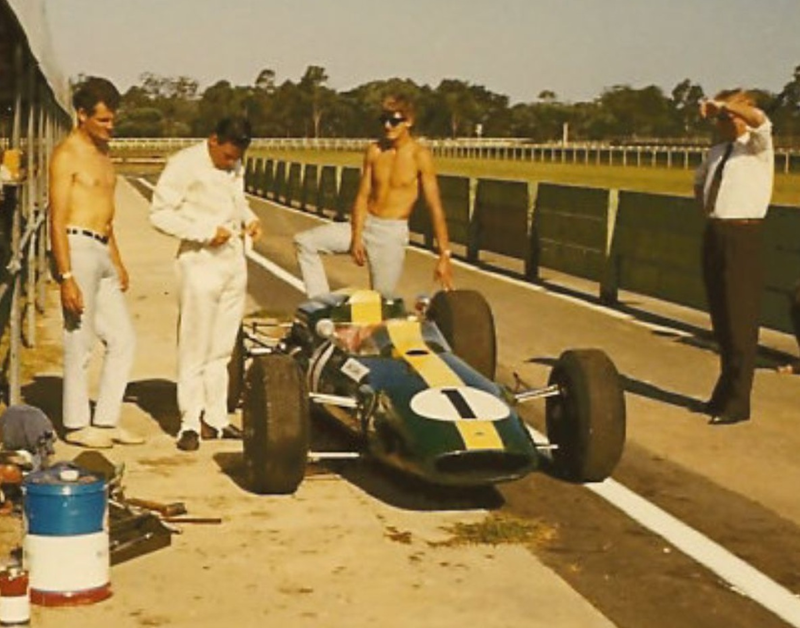 John’s first event with the team was preparing Leo’s car for the Australian Formula Junior Championship at Warwick Farm in September 1963, which he won in his Lotus 22 Ford. He shares some of his recollections about his time with the Geoghegan’s throughout this article. Essentially 1966 was a learning year for Leo in the big cars in the domestic Gold Star Championship. His limited campaign excluded the Mallala and Sandown rounds, 2nd to Spencer Martins Brabham BT11A at Surfers Paradise his best result. A duff wheel bearing was the cause of a DNF at Lakeside, he didn’t start both the Symmons Plains and Warwick Farm rounds with Coventry Climax engine problems. Sheppard recalls; ‘The Lotus 39 was a great car although the engine problems we had were a function of very tired engines, the blocks were cracked so it was a problem keeping them running in that first year. 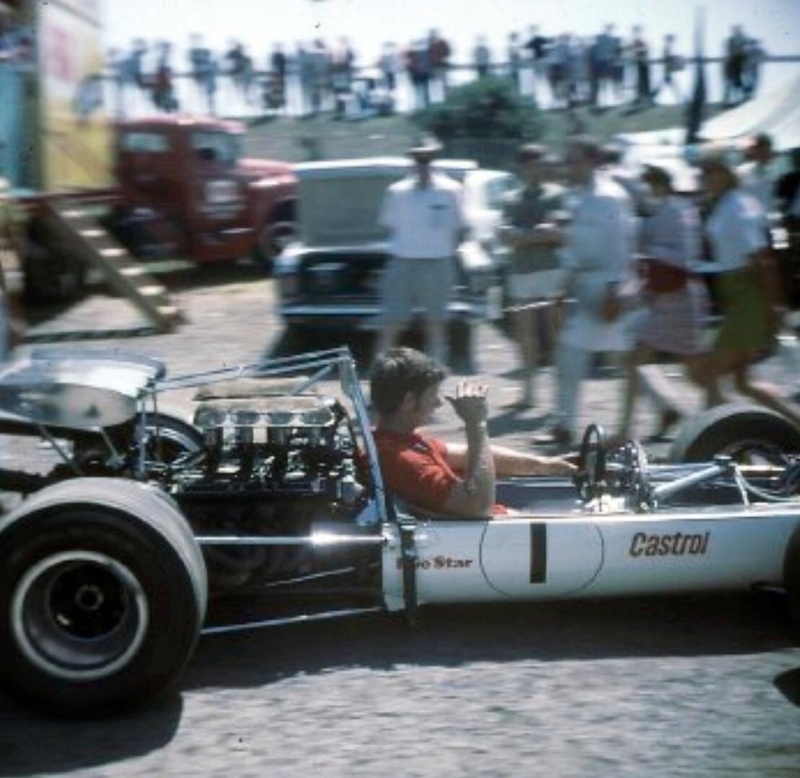 When we took over the car they had a strange set-up to deal with the vibrations of the big Climax-four, they put rubber o-rings between the cylinder head and inlet manifold letting them flop around, and i mean flop around so Jim had problems with throttle control. We easily fixed this with a more conventional set-up of putting the o-rings between the inlet manifold and carbs’. 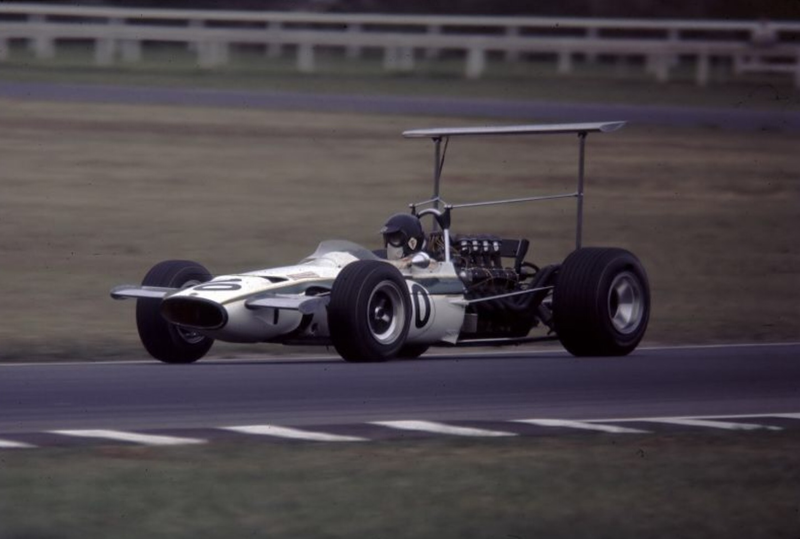 Fifth in the Australian Grand Prix ’67 Tasman Round at Warwick Farm and 2nd the following weekend behind Clarks Lotus 33 Climax FWMV 2 litre V8 at Sandown was indicative of speed and better Coventry Climax reliability. In 1967 Sheppard and his team did a beautiful job converting the car to a 2.5 litre Repco ‘640 Series’, ‘exhaust between the Vee’ spec engine in April. They created quite the most beautiful sixties single seater. OK, maybe Gurney’s Eagle T1G gives it a run for its money! The FPF developed around 235bhp, the ‘640’ 275bhp@8500rpm. The Climax FPF engined Brabham BT11A’s were superbly driven by Spencer Martin and Kevin Bartlett and just had the legs and reliability to pip the more powerful Repco engined cars of Greg Cusack, Geoghegan and John Harvey that year. Martin took the title. 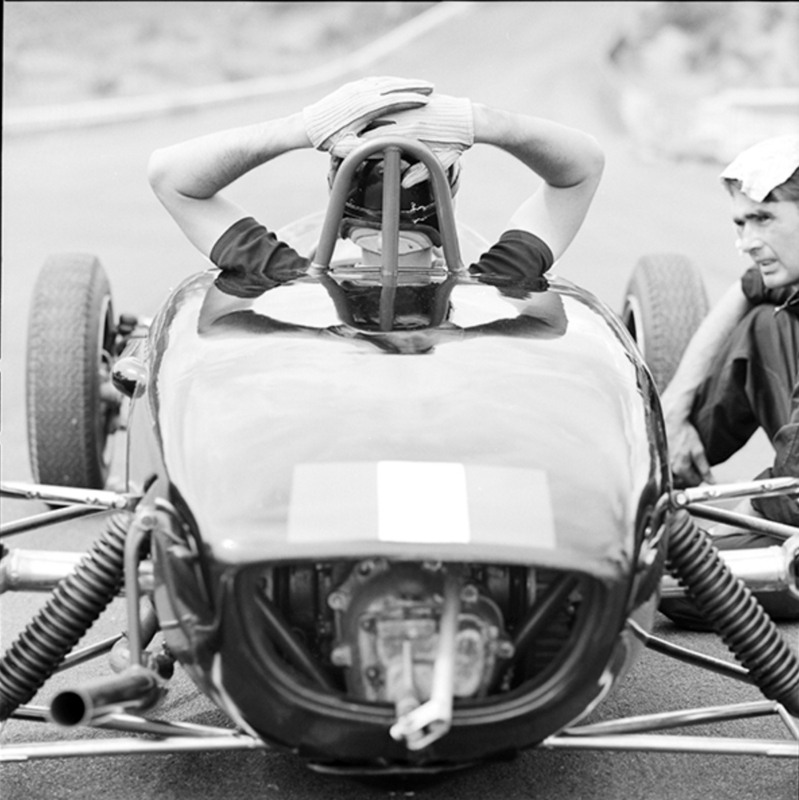 Leo was so miffed by the lack of reliability of the Repco that his team popped the Climax back into the car for the final Gold Star round, the Hordern Trophy’ at Warwick Farm, not finishing that race either, the Climax overheated. For the 1968 Tasman Series all local Repco clients engines were updated to the latest specifications with 700 Series blocks. 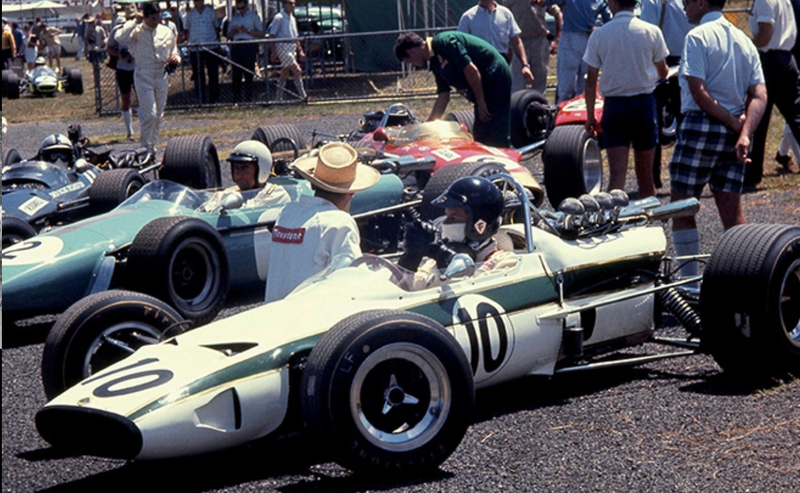 Into 1968 the Tasman Series got even tougher as the International Teams brought 2.5 litre variants of their current GP machines; the Lotus 49 DFW and the BRM P126 V12. 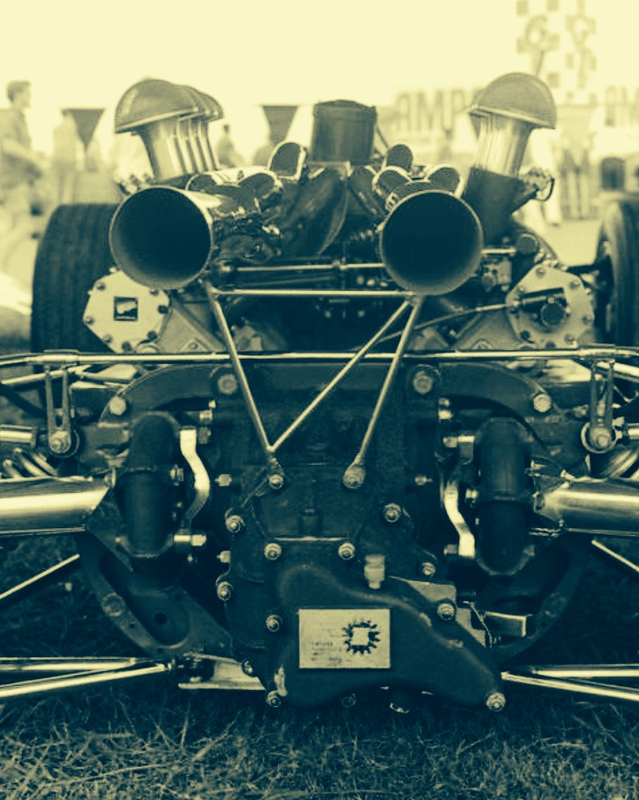 The Mildren Team acquired a one-off Brabham BT23D powered by a 2.5 litre version of Alfa Romeo’s Tipo 33 sports car engine and Ferrari brought 2 2.4 litre Dino V6’s, the 246T. 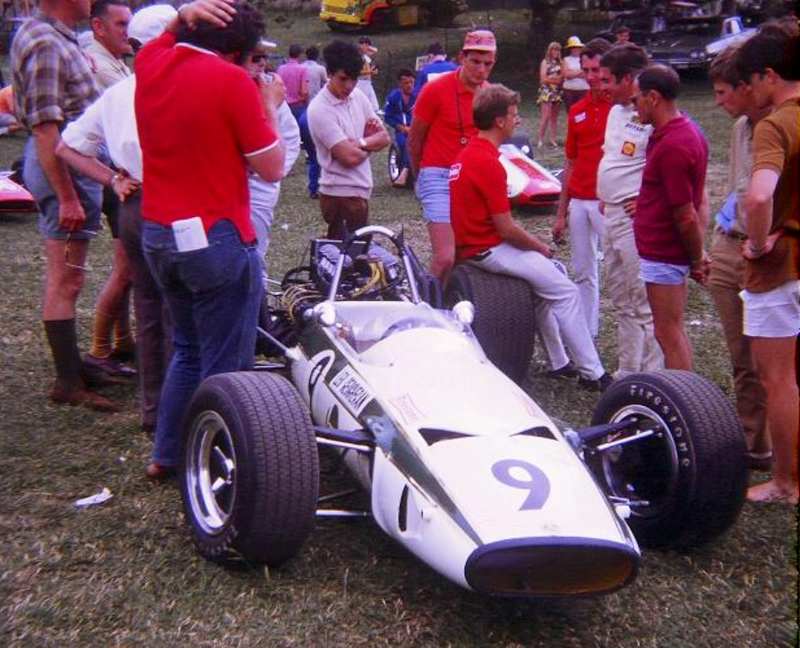 Geoghegan, as in the prior year did only the Australian rounds; his 4th at Surfers on the same lap as the new Lotus 49’s in his 3 year old car his best result. 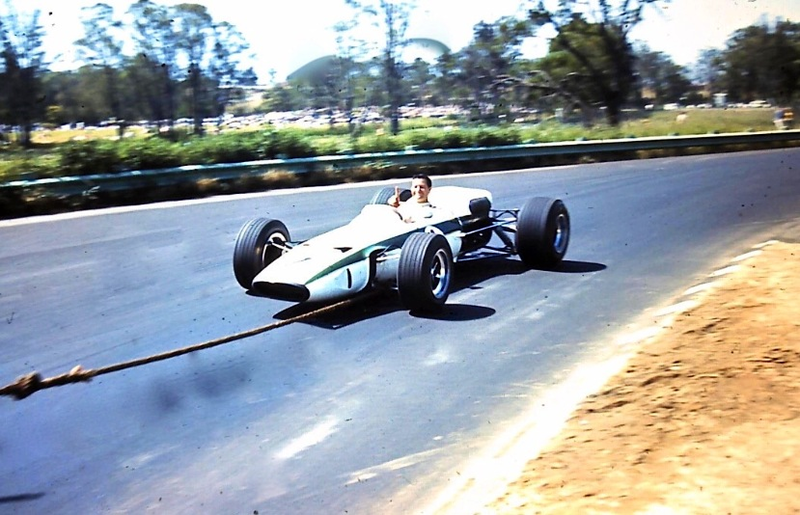 He lost an oil line at Warwick Farm, finished 7th at Sandown, both events won by Jim Clark’s dominant Lotus 49 and elected not to start the final, very wet Logford round given the lack of a suitable tyre for the treacherous circuit. 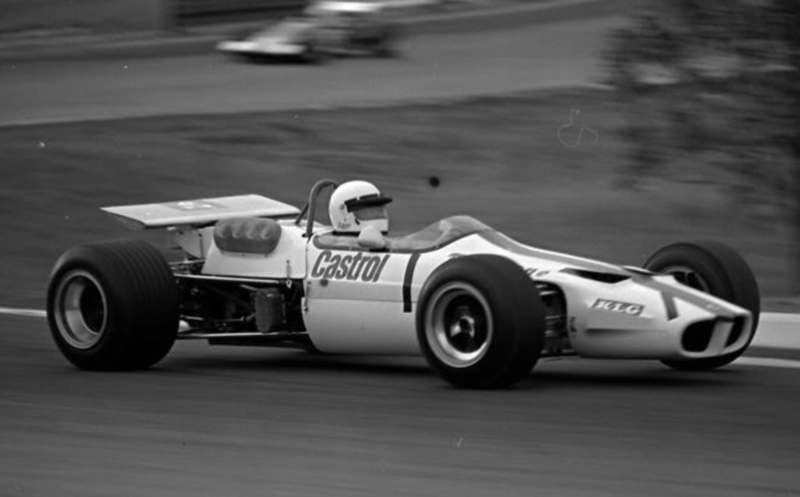 Kevin Bartlett was the class of the Gold Star fields in 1968 winning the title by 10 points in the Brabham Frank Gardner drove in the Tasman. Geoghegan’s old Lotus was still fast; he took pole at Sandown and Mallala and won the race but otherwise the car lacked the consistency and speed to win the title. Chris Amon took the 1969 Tasman in his superbly driven and prepared Ferrari Dino 246T from Jochen Rindt, Lotus 49 DFW Piers Courage, Brabham BT24 DFW and Derek Bell’s Dino 246T. Geoghegan, still driving the ‘old lady’ contested the full series; 5th at Pukekohe in the series opening NZGP behind the four drivers above, 4th at Levin, he missed the final NZ, Teretonga round. Straight to Queensland he was a splendid 3rd in the AGP at Lakeside behind Amon and Bell. He was 5th in his home, Warwick Farm race and had fuel tank problems in the final Sandown round. Seventh in the series, the highest placed local was a superb result for a small team running a 4 year old car against GP Teams running their latest car. For the 1969 Gold Star Series the 39 was more competitive than in ’68 being fitted with the latest Repco’730 Series’, crossflow head V8 used in the Tasman, this gave 290bhp@8600rpm. The car was now running wings and whilst less aesthetically pleasing than its earlier form was fast. 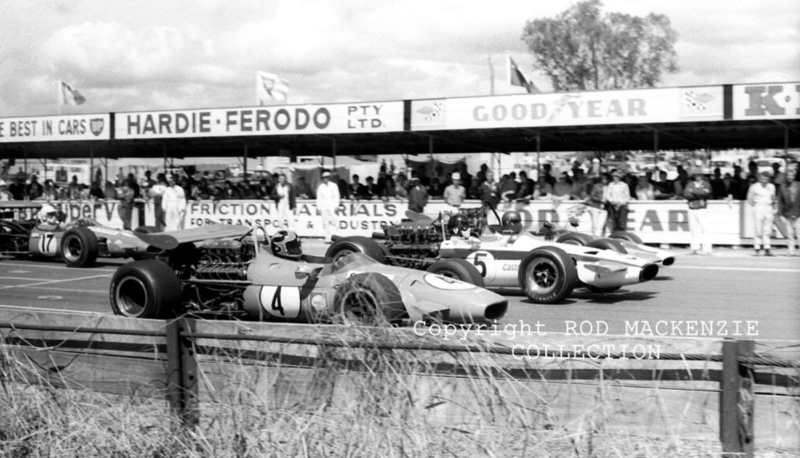 Interesting shots at Symmons Plains, Tasmania 3 March 1969 above and below. Both the 39 and Kevin Bartlett’s Mildren Alfa ‘Yellow Submarine’ sporting the hi-wings de-rigeur for the previous 12 months and soon to be outlawed over the Monaco GP weekend a month or so hence. 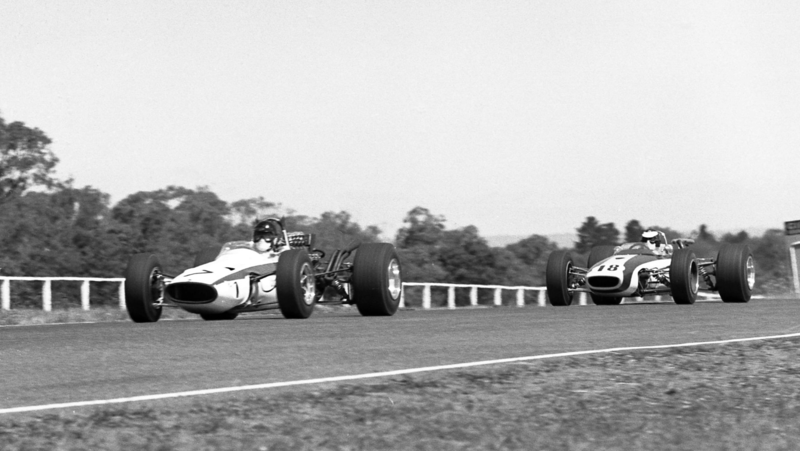 My two favourite ‘Australian’ open-wheelers of the 1960’s albeit not in their most aesthtically pleasing form. Bartlett won the round with Leo second. Repco ‘730 Series’ Repco V8, notice the steel ‘A-Frame’ to brace the wing supports referred to in the text and wider rear wheels but same sized fronts compared with earlier shots. Tyre widths increased dramatically from cars build in 1965 to 1970. 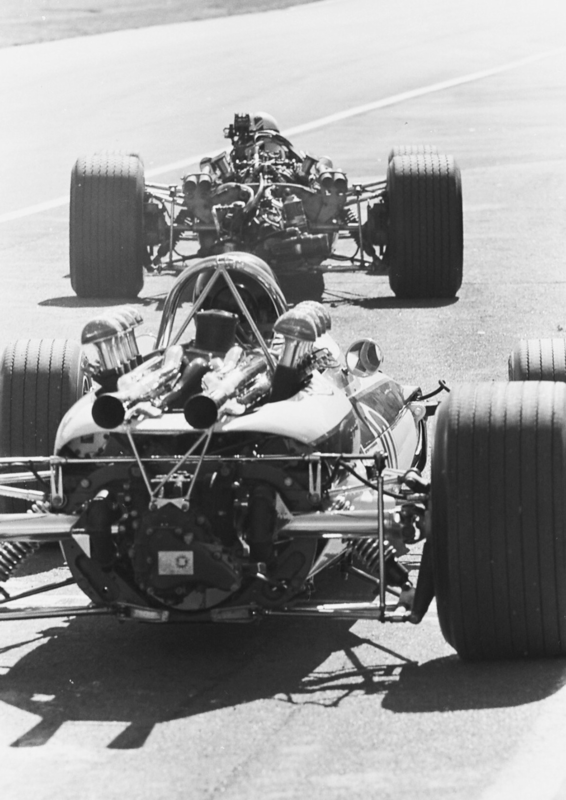 Locating stays for the 39 rear wing beefier than most, the failure of these in a whole swag of cars, notably the two Lotus 49’s of Rindt and Hill during the 1969 at Montjuich Park, Spanish GP the catalyst for the CSI to mandate changes to wings. Kevin Bartlett took the Gold Star championship again using the Mildren ‘Yellow Submarine’, initially Alfa Romeo V8 engined and later in the year in Waggott TC4 valve form. This engine developed by Sydney engineer Merv Waggott is a story in itself, it won Gold Stars for Bartlett, Geoghegan and Stewart in 1969-71 beating 2.5’s and in 1971 F5000’s to the title. Leo was 2nd with 20 points to Kevins 33 and had reliability but perhaps not the ultimate speed, seconds at Symmons Plains and Mallala Gold Star season highlights for the old beast. 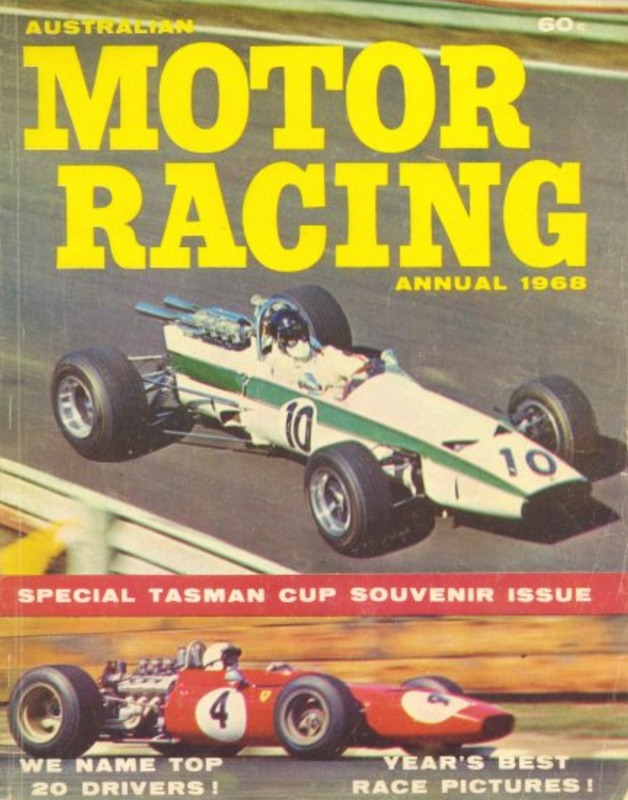 By 1970 F5000 was adopted as the new Tasman Formula albeit 2.5 litre Tasman cars were also eligible, the smaller cars gave the big V8’s ‘plenty of curry’ in that first year with Graeme Lawrence winning in Chris Amon’s victorious 1969 Ferrari 246T ‘008’. 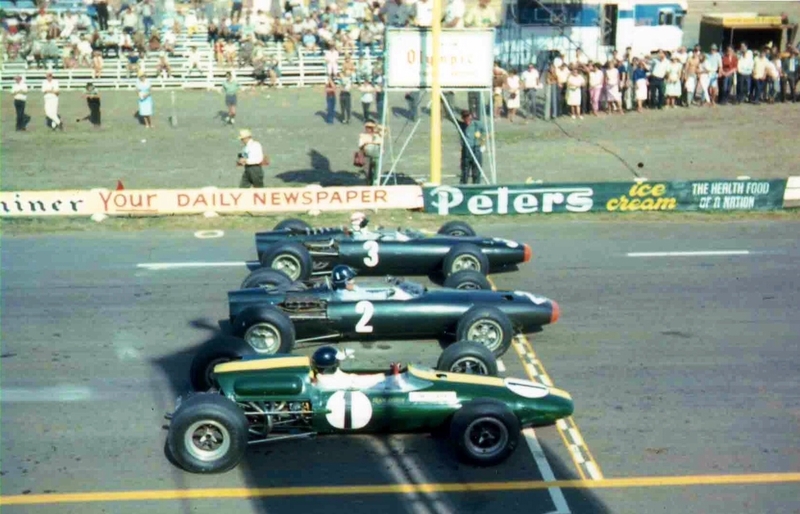 Bartlett took the Warwick Farm round in the 2 litre Mildren ‘Yellow Sub’, another small-car win..
Geoghegan raced the Australian rounds only for 7th at Surfers and Warwick Farm, he was DNF at the Sandown final round. 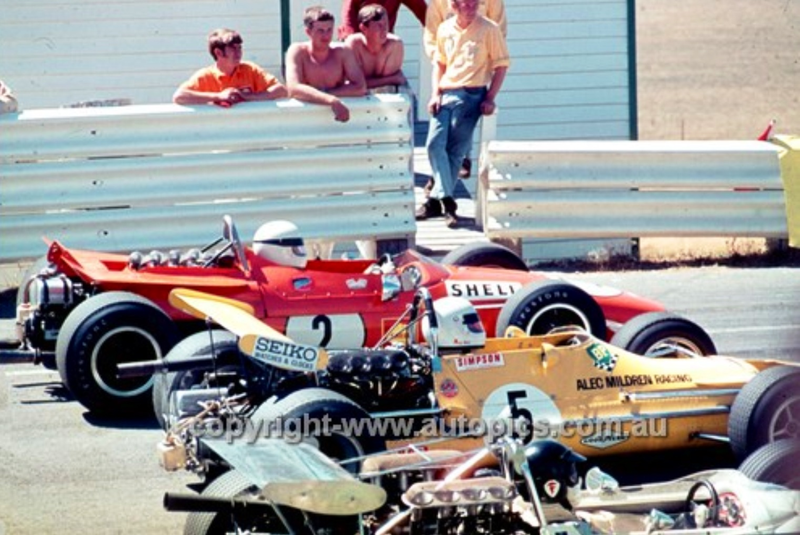 Into the domestic 1970 season Leo raced the car in the first Gold Star round at Symmons Plains, here below he shares the front row of the grid with John Harvey’s red Brabham BT23E Repco and Kevin Bartlett’s Mildren Waggott ‘Yellow Submarine’. 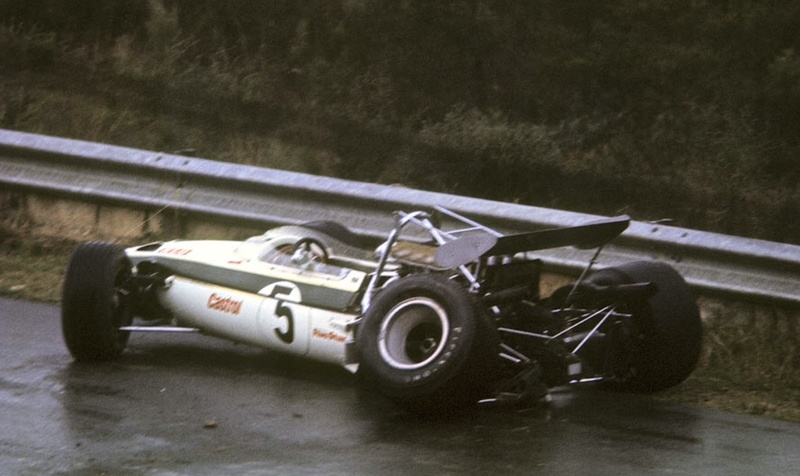 KB’s absence racing in the US for much of the year took out a tough adversary in 1970. The last significant meeting in which the 39 raced was the March Easter Bathurst meeting in which Niel Allen’s McLaren M10B Chev F5000 car set a lap record which stood for decades. ‘Outright’ open-wheelers have not raced at Mount Panorama given the speeds of the cars and inherently dan gerous nature of the circuit as it was then. And still is, despite huge improvements in circuit safety. 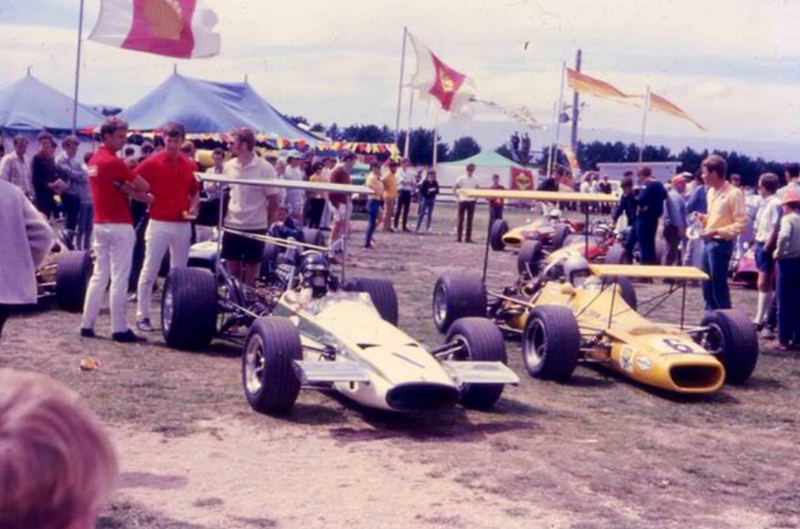 Whilst the 1970 Tasman series was run to F5000 the Gold Star Series in an interesting piece of CAMS (Confederation of Australian Motorsport) decision making driven by politics was run to the 2.5 Tasman Formula. From Leo’s perspective the path was clear; the circa 275bhp 2 litre Waggott engine was powerful, light, reliable and better still would bolt straight into the back of the Dave Baldwin designed F3/F2 Lotus 59. 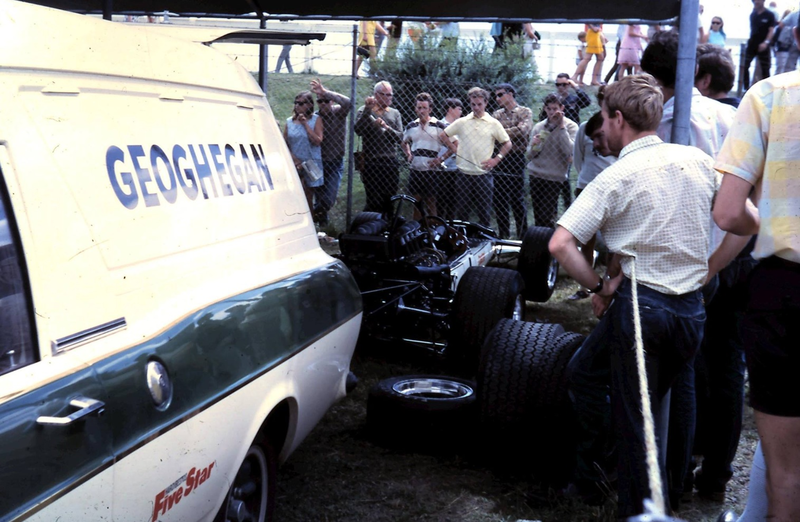 As the Lotus importer, the core of the Geoghegan’s business road cars of course, his preference was a Lotus which could win the title, his F5000 options were a domestic season away. The 59 already had a successful season of racing in Europe with Emerson Fittipaldi taking the 1969 British F3 title and Jochen Rindt and Graham Hill winners in European F2 events; 4 rounds for Jochen and 1 for Graham. In essence the engine and chassis were a proven package. This article was to have been a ‘quickie’ around the few shots at the start but as usual i have ‘rabbited on’. 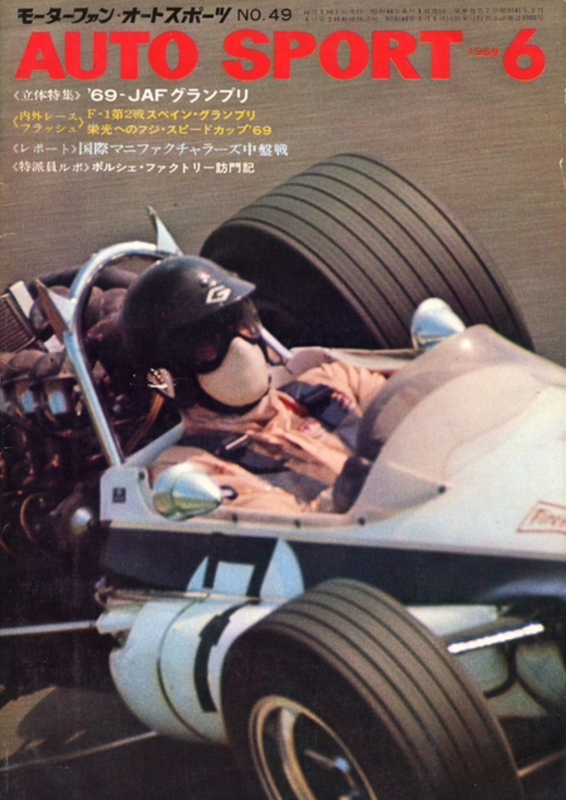 The article isn’t intended to be a Leo G whole of career one, the focus was the Lotus 39. 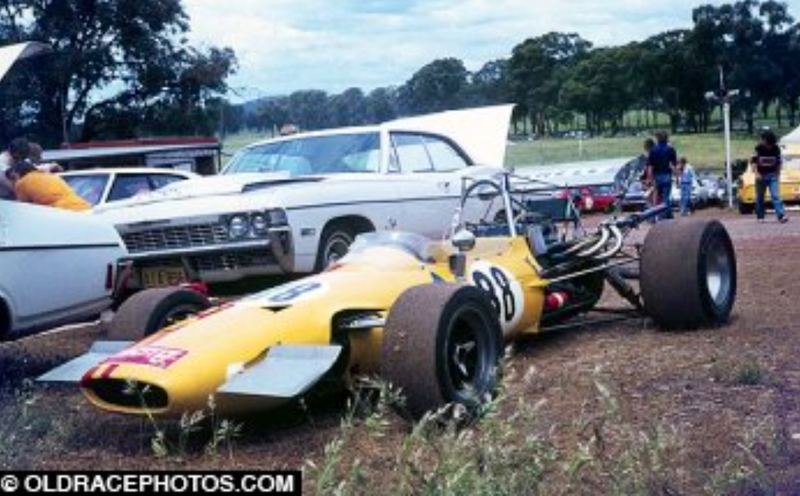 Leo raced the Lotus 59 Waggott on into 1971, that chassis is still in Australia, i will write about it separately. Geoghegan was a factory driver for Chrysler, as covered in the other article link provided earlier, he developed and raced Valiant Pacers and Chargers for the Tonsley Park, Adelaide based company in the incredibly popular Series Production (showroom stock essentially) races which proliferated, like a disease, in Australia in the late 1960’s, the growth of ‘Taxi Racing’ in Oz remains undiminished and omnipotent. But Leo was a ‘died in the wool open-wheeler man’ and accepted a works drive with Adelaide’s nascent Birrana Engineering; Malcolm Ramsay and engineer Tony Alcock built some fabulous cars in three short years which turned upside down the local single-seater market, the jewel like cars winning the Australian F2 Championship from 1973-1976. 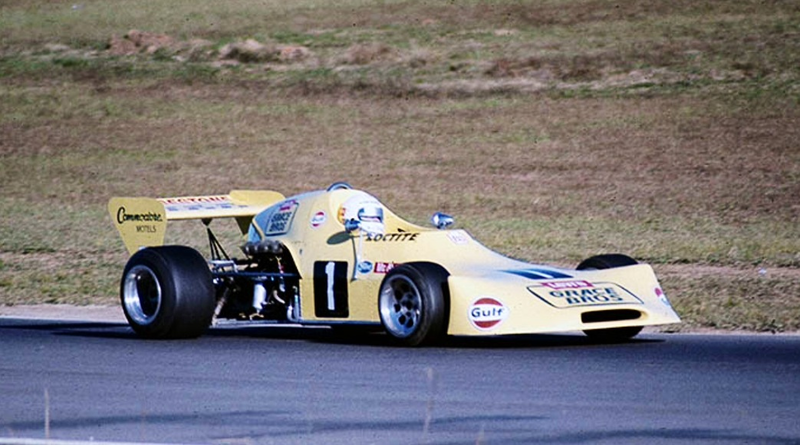 Leo took two of the titles in 1973 and 1974, finally retiring from single-seaters at the end of 1974. He went out with a bang though. The 1974 AF2 Championship was one of the most closely contested and competitive openwheeler championships in Australia ever. ‘Van Heusen’ shirts tipped in good sponsorship and established F5000 aces and young thrusters made for some sensational racing. But wily Leo, at 38 still very fast took the title by 4 points from Aussie International Bob Muir in another Birrana. Birrana Cars is a story for another time. John Sheppard on Leo as a driver; ‘He was incredibly fast, as good as anyone he competed against capable of just not keeping up with but beating world champions. Leo in a way kept to himself, Pete was more ‘one of the boys’ so Leo and i didn’t discuss his career aspirations but he got a lot of satisfaction from racing with the drivers that he did; world class drivers. He was very precise, Pete would throw around what he was given, Leo used the same bit of road lap after lap, very consistent, precise and fast’. Leo focussed on the 59 but gave Formula Vee ace Bernie Haehnle a test of the 39 in the wet, at Amaroo Park in May 1970. With predictable results, poor Bernie took the left-rear corner off the car. The difference from a 40bhp Rennmax FV to 280bhp Tasman car in the wet would have been marked! The car was tidied up visually, Leo gave it a run at Warwick Farm late in the year in its original color scheme but still running a Repco engine, it was then offered for sale. The Repco engines on loan were returned to Melbourne and those owned by the Geoghegans sold. 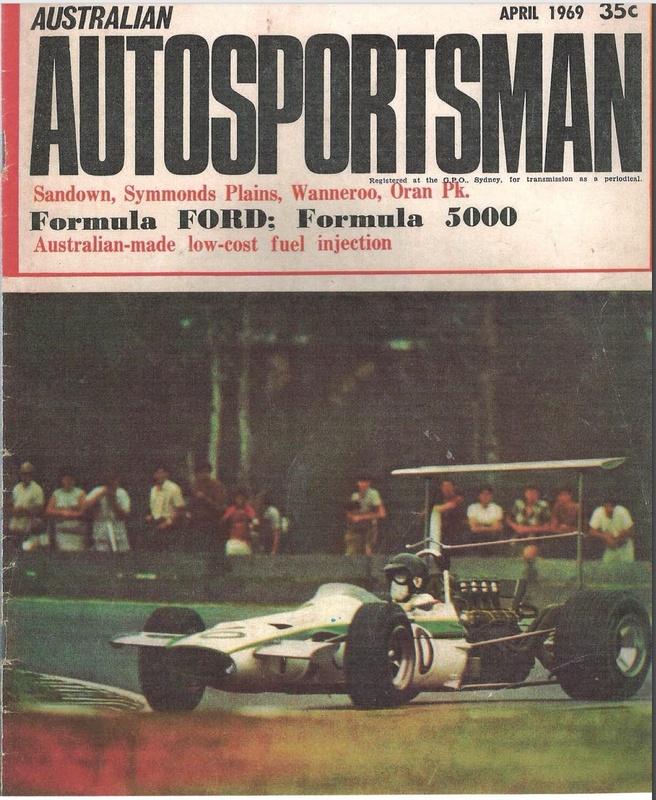 Australia’s sports-racing car fields were the beneficiaries of a surplus of ‘cheap’ 2.5 litre Repco V8’s; two Elfin 360’s and two Rennmax’s specifically. The long racing life of R12 continued on for a year or so as an AF2 car, Darryl Pearsall the new owner. 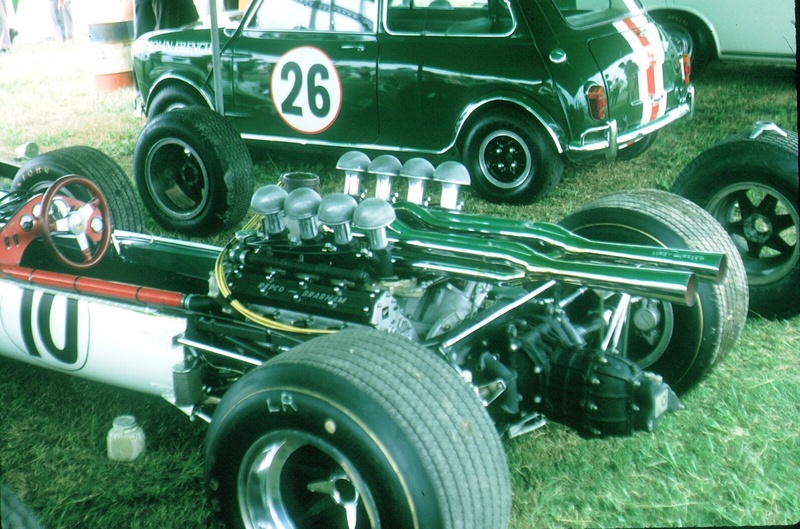 F2 then was a 1.6 litre, 2 valve class effectively mandating the Lotus/Ford Twin Cam. The car was fitted with a Twin-Cam and when sold was purchased by John Dawson-Damer for his superb collection of Lotus’s in 1976. The car was restored to its original Coventry Climax FPF engined form and fortunately when sold after JDD’s death and realisation of some of his collection remained in Australia, fitting given the cars Australian history. It lives in Tasmania loved to bits by a lifelong Jim Clark fan, Chas Kelly. Click on this link for a lovely story related to the photo above about the ’66 Tasman. Thanks ‘Spyder’ glad you enjoyed it, did you see the car race? Mark I am not sure but I probably did although that was about the time I started going to the races. I certainly saw Leo in the Birrana! I don’t think that Lotus 23 shot can be from the 1965 Australian Tourist Trophy as the 23B Ian drove in that race was in white “Total” livery rather than the earlier black colours. The photo may be from the 1963 Australian Tourist Trophy which was held at Lowood on 9 June ’63. Ian’s first 23 was in Total black at that race. Will make the caption more generic ‘twould be interesting to know exactly when/where, did you see the 39 race? 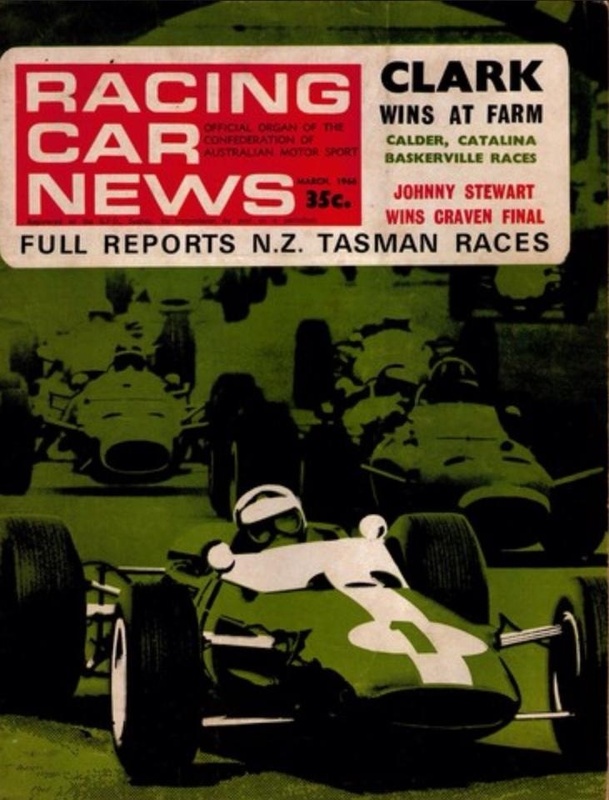 On second thoughts the Lotus 23 image is not from the 1963 Australian Tourist Trophy either as the car did not carry the Total Team signwriting at that event (as per image on front cover of Racing Car News, July 1963). I will certainly let you know if I ever come across anything which would pinpoint the actual time and place. 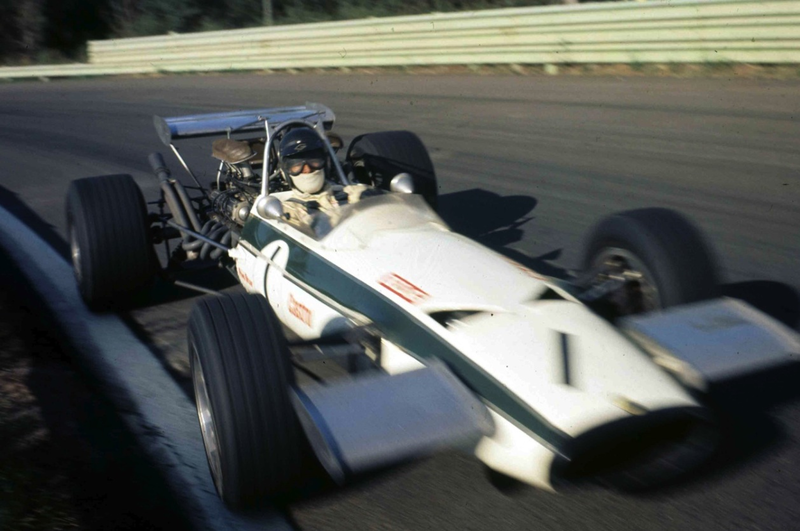 Yes I did have the pleasure of seeing Leo in action in the Lotus 39. 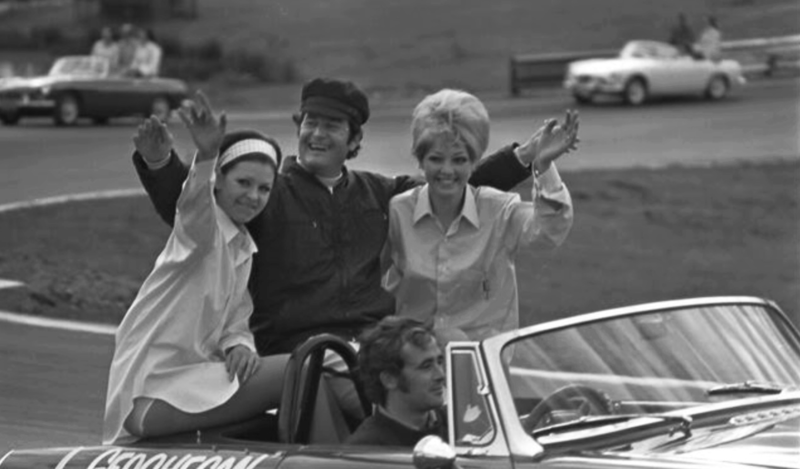 He brought the car across to South Australia for the 1967, 1968 and 1969 “Gold Star” races, recording a DNS, a win and a second in the three visits. 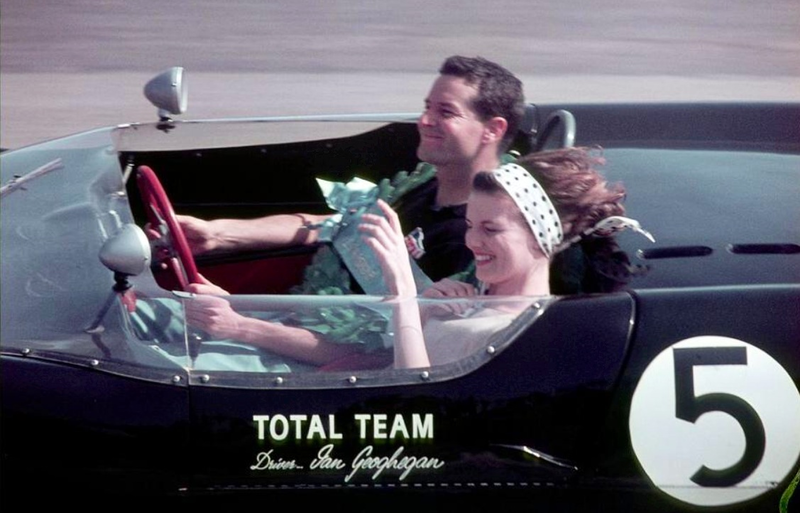 I regret that I never saw Leo or Ian driving a Total Team car. Total fuel was not sold in South Australia which, I assume, meant that there was no incentive for the boys to bring their Total toys to SA. 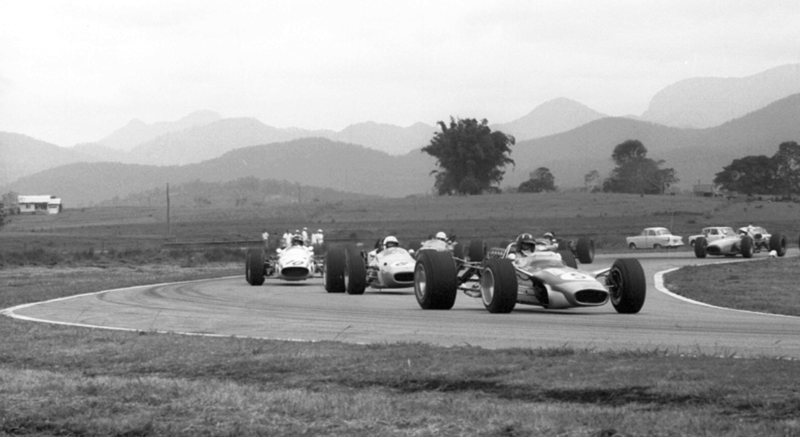 Thankfully they moved across to Castrol, which meant that I did get to see the Lotus 39, the Lotus 59 and the 1967 Ford Mustang. I had the pleasure of speaking to Leo at an “All Chrysler Day” in Adelaide in 2011 and he told me that his 1969 Japanese victory in the 39 had made him a millionaire. He did however express regret that this was an achievement measured in Japanese yen rather than Australian dollars!!!! Leo was so quick in the Birrana’s, I saw him race all three of them but totally missed his Lotus period, sadly that was just before I got interested! Actually I did see him race Chargers as well but touring car races was when I went to buy a burger. I used to watch and enjoy the Vee races! Will just make the 23 caption generic! 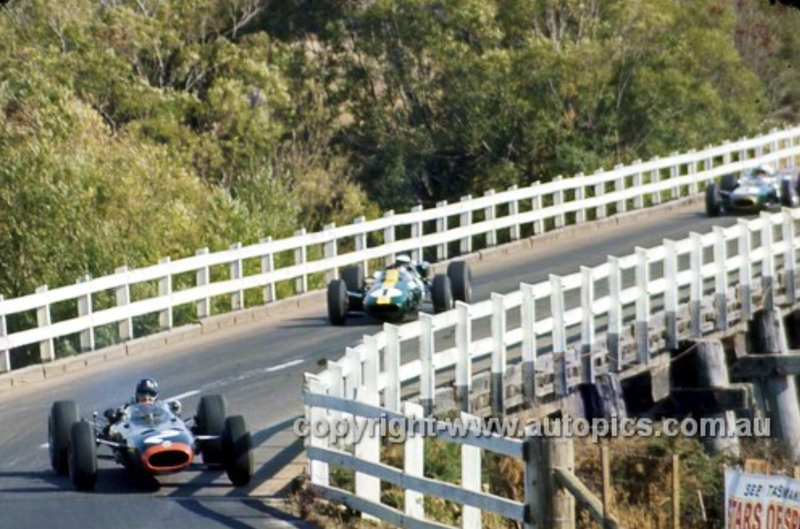 The caption of the 1966 Longford “Long Bridge” photo above refers to “Jack Brabham’s Brabham BT11A Climax”. 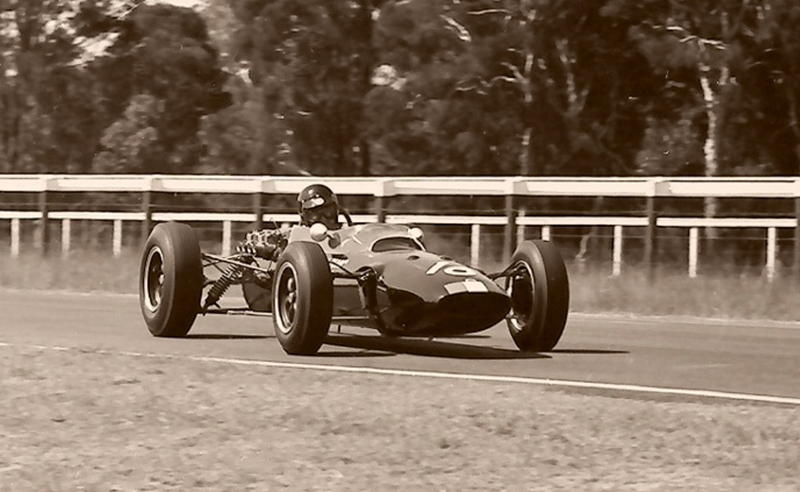 Wasn’t Jack driving the Repco Brabham BT19 at Longford that year? That error has been there a while! The Repco RB620’s third race- they were getting there, ‘hummin by mid-season of course!